Prepare this delicious Crustless Bacon and Cheese Quiche. 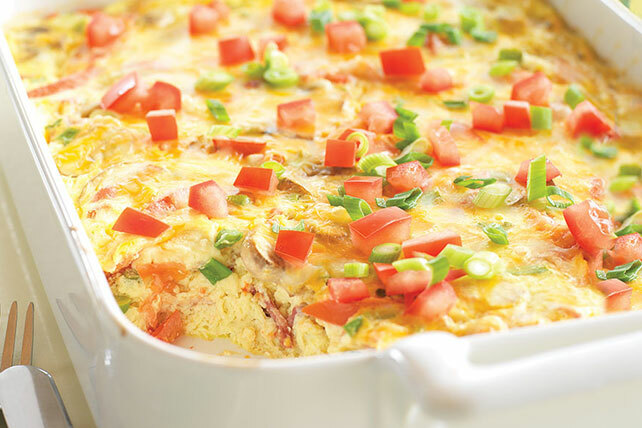 Avoid the fuss of crust with this cheesy quiche which incorporates a variety of fresh veggies. Reserve 2 Tbsp. each onions and tomatoes. Cook bacon in large skillet until crisp. Remove bacon from skillet, reserving 1 Tbsp. drippings in skillet. Drain bacon on paper towels. Add mushrooms to reserved drippings; cook and stir 2 min. or until tender. Remove from heat. Crumble bacon. Add to skillet with remaining onions and tomatoes; mix well. Beat eggs and sour cream with whisk until blended. Pour into 13x9-inch baking dish sprayed with cooking spray; top with bacon mixture and cheeses. Bake 30 min. or until center is set. Top with reserved onions and tomatoes. Let stand 5 min. before cutting to serve. For a delightful brunch idea, serve this Crustless Bacon and Cheese Quiche with a seasonal fruit salad. Prepare as directed, stirring in 1 thinly sliced zucchini with the mushrooms. Substitute 2 cups KRAFT 2% Milk Shredded Colby & Monterey Jack Cheeses for the cheddar and mozzarella cheeses.